On Tuesday 7th October, Arts for Health Cornwall held a consultation event on proposed art interventions for the new Truro Health Park site. 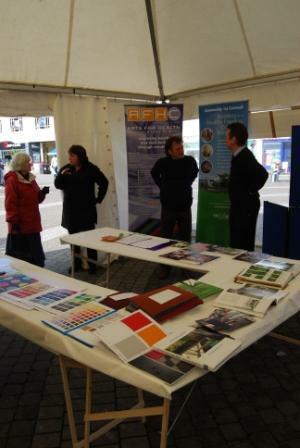 A marquee on Lemon Quay in Truro provided the venue for the commissioned artists to show their initial ideas to the general public. 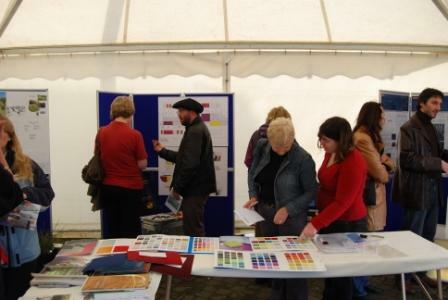 Despite it being a very rainy and blustery day, over 80 people came into the marquee to see the proposals and talk to the artists. The proposals included designs for the internal courtyards by Steve Geliot which used plants such as blue-stemmed bamboo, together with sculptural elements which would reflect light and give a sense of movement to the spaces. Staff who will be working in the building were particularly excited by the new aspects from their offices and clinical areas that these courtyards would offer. The big Monterey Pine trees which are on site are being retained and Mike Westley and Rob Olins have worked on ways of enhancing their beauty and providing a ‘walk for the mind’ for people using the glazed corridor that runs past them. The design of the flooring was felt to be very important to all users of the building and there was strong support for Will Levi Marshall’s use of blocks of coloured tiles to identify different areas of the building and help people find their way round. Claudio Benghi and Gloria Ronchi are designing pieces for the two main entrances to the building and had demonstrations of LED lighting effects together with colourful displays of innovative designs based on the ‘three rivers’ of Truro. There was overwhelming support from the public and staff for invigorating the Health Park with art works, with one gentleman commenting that “ I think about 30% of the healing is in the design of the building” and others saying that they were delighted that we were trying to bring some colour and life into what can often be bland spaces. “Make it a talking point,” was one comment, “bring in some interest, variety and maybe even daring or controversial”. People were also appreciative of efforts to enhance and reflect the natural environment in the internal building, and were especially intrigued by the unique nature of the courtyard proposals. Suggestions for further arts interventions included having space for changing art works, perhaps produced by the local community; this will be incorporated. Some people also mentioned the idea of having music or sound in parts of the building. Many people committed their comments to sound recording and Arts for Health Cornwall will be putting some of these on their website. The final designs will be presented back to the staff and public once they have been approved by Community 1st Cornwall and their partners.